Further cementing its leadership in digital engagement, Jollibee dominated the 9th YouTube Ads Leaderboard in the Philippines with an unprecedented four videos making it to the list of most viewed ads for the first half of 2018. The viral Kwentong Jollibee short films “Signs,” “Status,” and “Homecoming” under the well-loved Valentine Series landed in the second, fourth, and fifth spots, respectively. The “Wassabi for Wasabi Fries” campaign featuring the brand’s collaboration with top YouTube creator Alex Wassabi also made it to the list at number six. This is the most number of videos from a single brand that has made it to any YouTube Ads Leaderboard since it started in the Philippines. With all three of its viral videos landing in the list’s top 10, #KwentongJollibee has also set an unprecedented feat as the first full campaign series – all in long format videos – to be recognized in the YouTube Ads Leaderboard. 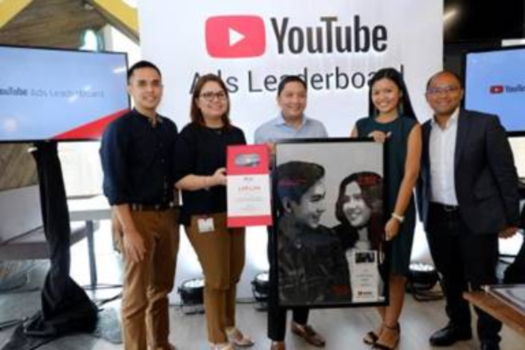 Released by Google Philippines, the bi-annual YouTube Ads Leaderboard recognizes the top 10 brand advertisements on YouTube that resonated most with audiences across the country during the first or second half of the year. Since its launch in February this year, the latest #KwentongJollibee Valentine’s Day video series topped the rankings with a consolidated 12.2 million YouTube views and 61.5 million Facebook views. “Alex Wassabi for Jolly Crispy Fries” garnered 3.4 million YouTube and 3.1 million Facebook views as of August 2018. “Capturing no less than four out of the 10 spots in the YouTube Ads Leaderboard is a great honor for us and a strong indication of how Jollibee is consistently able to engage millions of Filipinos through innovative online content and authentic storytelling based on powerful truths. We’re sharing this award with our hardworking agency partners, McCann World Group Philippines and Stuvvs Inc. who worked with us in these campaigns,” said Arline Adeva, Jollibee Philippines Assistant Vice President for Brand Communications, PR and Digital. Both “Status” and “Homecoming” also received the Lola Basyang Award—a special recognition bestowed by the YouTube Leaderboard attendees to the ad with the most compelling storyline. #KwentongJollibee is a digital campaign that recounts the many heart-warming experiences that are made memorable with the fast-food brand. It has engaged numerous individuals and families with videos inspired by true stories that show the joy of varying relationships, whether among friends, families or loved ones. Manulife is giving Hong Kong people a glimpse into what life in 2040 will be like should they not adequately prepare themselves fo..
Astro aims to digitalise at least 75% of its current technology infrastructure, applications and processes by year end. ..